“Communious Mouse” is a mouse device that gives the user an experience of others’ emotion in remarks on the web as experience of one’s own. This system modifies the body image extended to the interface that units with emotion others by altering internal sense through controlling the interface to access others’ remarks on the web. Operating a mouse device actively lets users feel the sense of agency toward a mouse device. 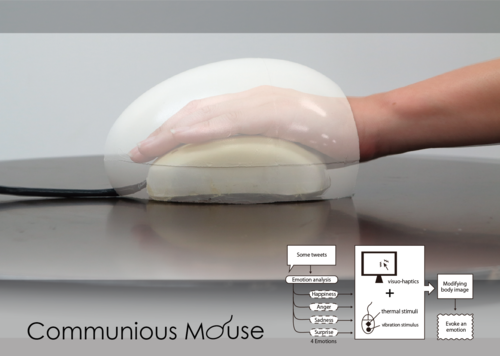 When users access the information of others on the web, the mouse device performs as the augmented body for users through an associative learning between a somesthesia and the visual sense which perceive a hand’s and a cursor’s movement. The system modifies the perception of the internal senses that defines the directionality of the body image and modifies the augmented body to fit to the emotion that others intended. The bodily temperature and the heartbeat are selected as the body response which are relevant to various emotions, because they are easy to surface to the conscious mind on the users hand. The former is shown by Peltier elements and the latter is shown by vibrations and visual effects for a cursor. To display this pseudo body response, the system applies the sentiment analysis to the remarks on the web. Happiness, sadness, surprise and anger are selected as the analysis objects. When a user put a mouse cursor on a remark which contains a certain emotion, physical and visual stimuli which evoke the body image related to this emotion are presented. This system can also be applied to the blog page and other social networking service.